Where do I begin? Creating art has been one of the most consistent and positive things I encountered in school. My high school art room was my sanctuary. It was in Karen Icenogle’s room that I always felt at home. I was allowed to experiment and try new things. Even if doing so resulted in failure. In middle school I had been working on a drawing that would later be transferred to a scratchboard. I ended up taking far longer than the other students to complete the initial drawing. It was then that my teacher, Nancy Pitlik, told me to skip the scratchboard and keep going with the pen drawing I was working on. I thought that was pretty cool that she was willing to highjack the project and allow me to move in a different direction. 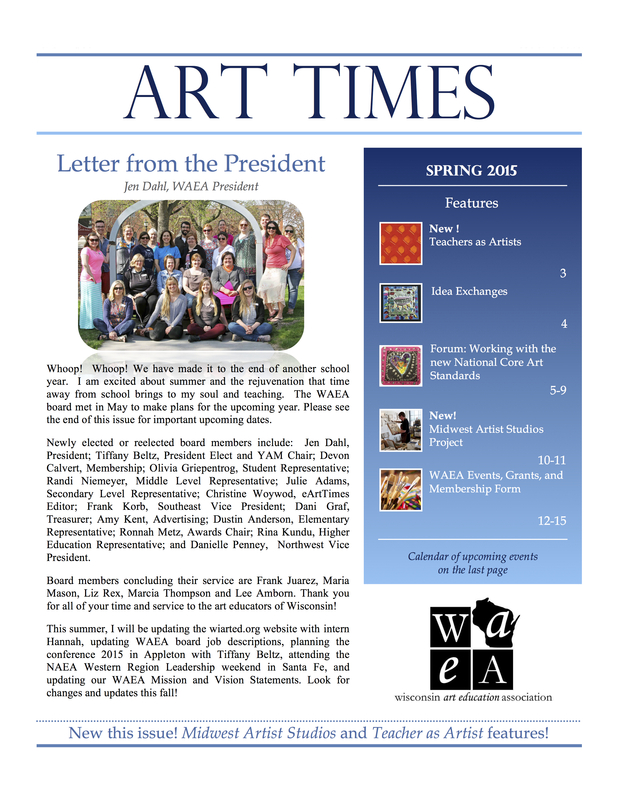 Art Education is important because it challenges students to become creative problem solvers. No matter what a student chooses to do with their life after they leave school they will be far more impactful and successful in whatever they choose if they can come up with creative solutions. Whether that be as an artist, educator, factory worker, doctor, custodian, you name it; all require creative problem solving skills. 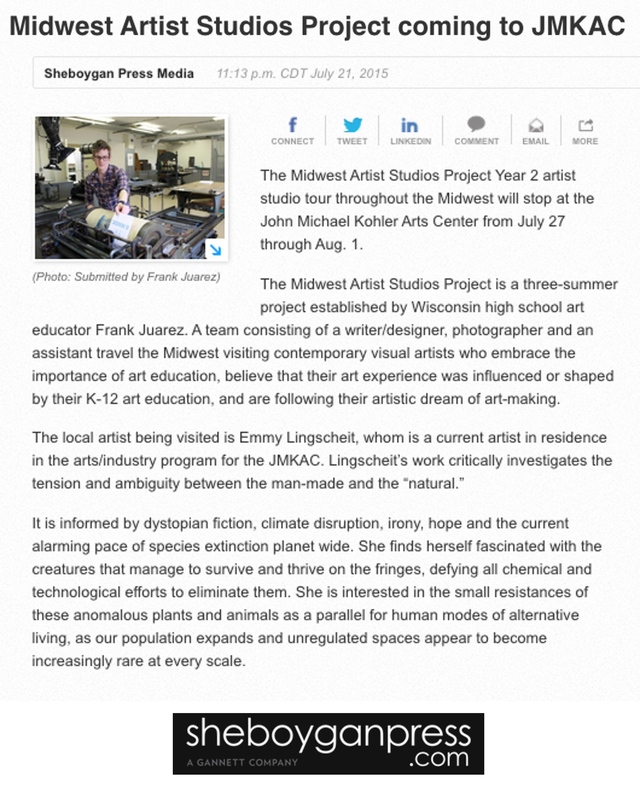 Art Education deeply fosters this type of development in a student. The symbolic meaning that can be found in the most ordinary, outdated and utilitarian objects intrigues me. These objects are rich with meaning and significance. Many times they have outlived their usefulness or purpose. Their place as forgotten objects allows us to see them re-imagined- we are able to see their metaphorical potential because we are able to distance ourselves from their original intent or purpose. My work explores these alternative or re-imag- ined meanings as they relate to the concepts of transition and discernment. Sculpting and carving these once common and everyday objects out of reclaimed lumber and clay is a sub- tle and transformative process. Through this process I reveal the unrefined qualities of the chosen material. Ultimately, the re-imagining of these seemingly outdated objects and dis- carded materials illuminates the deeper meaning that can be found in forgotten or cast aside items. This illumination, in turn, reflects on the way we view our own human experiences. I choose weathered surfaces and a neutral monochromatic palette to unify each piece and use hand tools and simple construction techniques to enhance the beauty of such materials. In re- gards to using reclaimed materials I embrace the challenge of making something out of a ma- terial that has seemingly lost its purpose or need-the things that others look past, the things that so often don’t fit the standard mold of perfection. I see the material not for what it was, but for what it will become. In my hands it still has worth and a purpose yet to be discovered. Jason Ackman is a high school art teacher and sculptor living in west central Illinois with his wife and two daughters. He received his BA from Western Illinois University and for the past 16 years he has been teaching a wide range of studio art classes at Rushville-Industry High School. 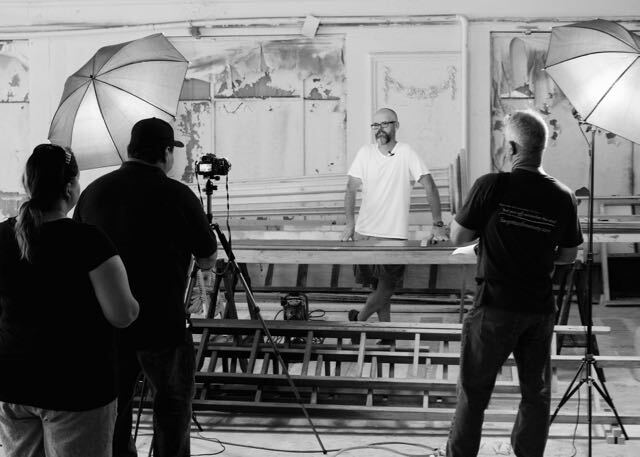 His studio practice over the past 5 years has been focused on the use of reclaimed lumber as a sculptural medium. 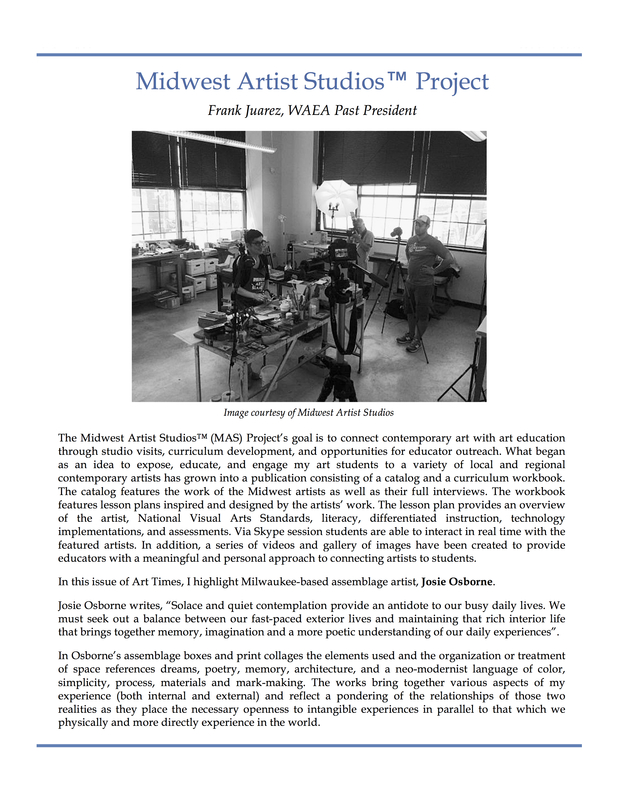 The Midwest Artist Studios™ (MAS) Project will be a constant feature in the Wisconsin Art Education Association’s future e-ArtTimes. Each issue will spotlight one of our featured artists. 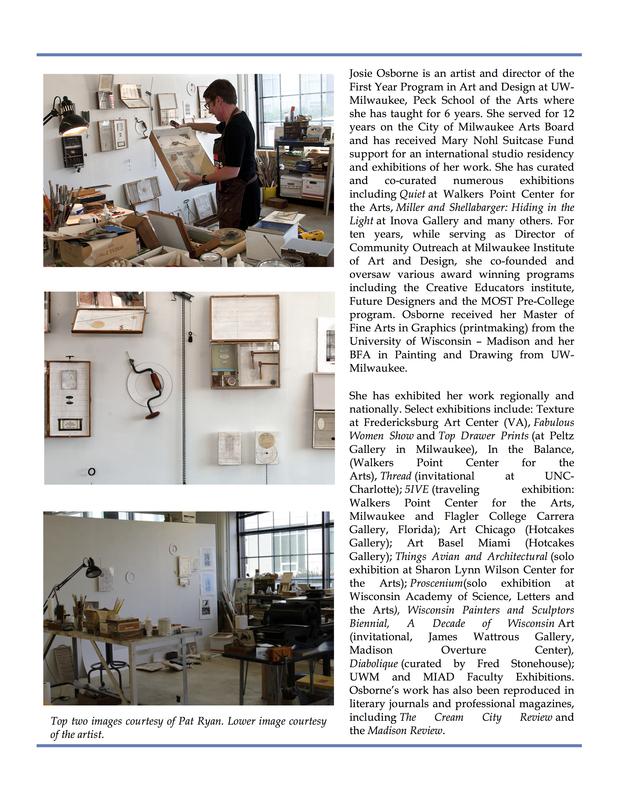 Congratulations to Josie Osborne from Milwaukee, Wisconsin.